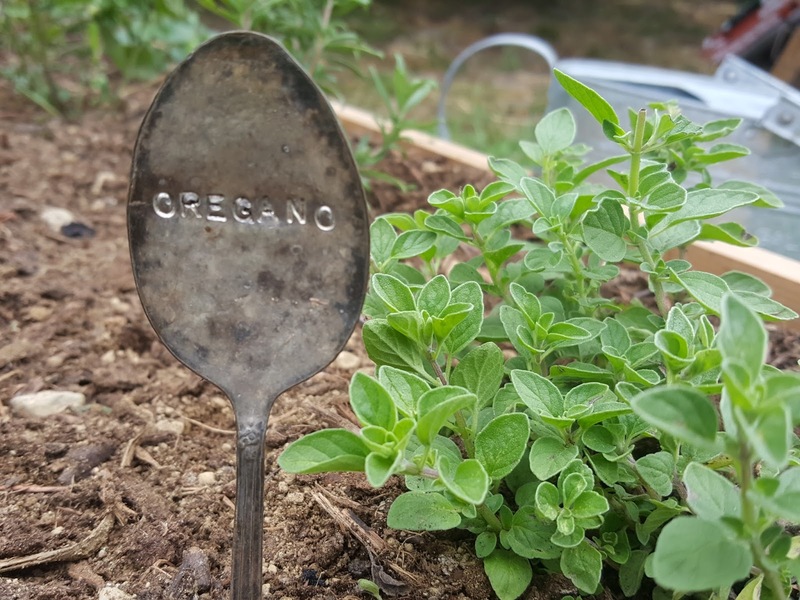 It was reported in the New York Times back in 2012 that the commercial chicken farm, Bell & Evans, has been using oregano as a natural antibiotic for their flocks. They have been experimenting with various natural substances to keep their chickens healthy, instead of using antibiotics, and have found that oregano oil and cinnamon specifically seem to work better than anything they've tried so far. The study and use of herbal medicine for humans and animals is a well-documented and time-tested practice that predates Western medicine by centuries. There's got to be something to it. But don't worry, you don't need a degree in holistic medicine or be an herbalist to incorporate herbs into your chicken keeping. Nearly every culinary herb has some great health benefits and is perfectly safe for your chickens. Oregano is one of the most powerful natural antibiotics ever studied and has been found to be superior to many of the currently used antibiotics. 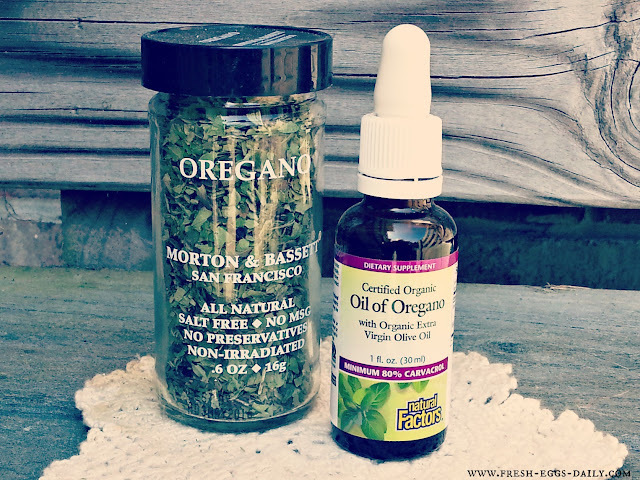 The oil is more potent than the fresh or dried herb, but in any form, its hard to deny the power of oregano. No, not many scientific studies have been done on herbal remedies on chickens specifically. But that doesn't mean they don't work. Little by little it seems that more and more folks are seeking natural preventatives instead of turning to commercial wormers, antibiotics and other medications in an effort to raise their chickens as naturally as they can. We eat their eggs, so even more than other animals we raise, we seem to want our chickens to be chemical-, hormone- and antibiotic-free. What we do know is that wild birds will line their nests with herbs, flowers and weeds. We also know that chickens seem to instinctively know what is good for them and what is not, what they need and in what amounts (think free-choice oyster shell or grit). So don't over-think things. 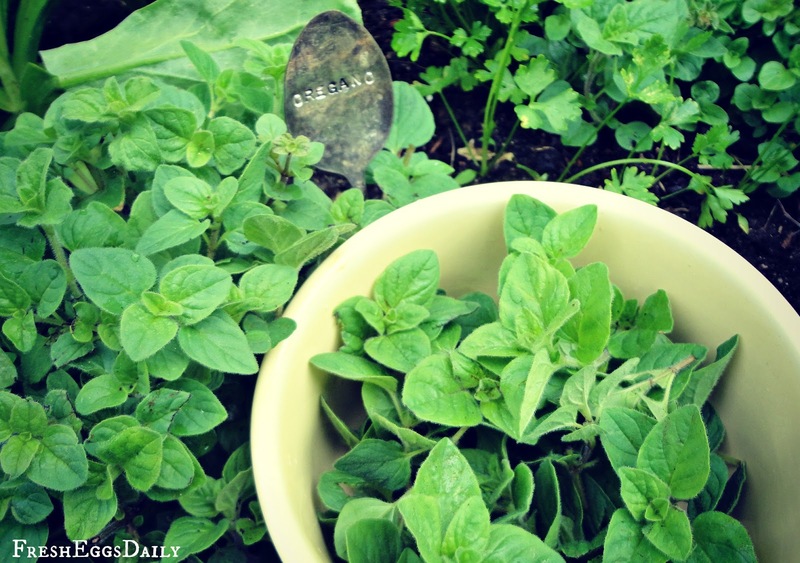 Grow some herbs for your chickens. (Oregano, thyme, lavender and mint are especially beneficial and fragrant.) Then toss the fresh leaves into your coop and nesting box and let your chickens decide. Offer them fresh oregano as a treat. Dry some to crush and add to their feed through the winter. They'll eat some of the herbs, lay their eggs on some and ignore some, letting those dry and scent the coop. It's a win-win for you and for your chickens. I keep oregano oil in my chicken first aid kit .....just in case. So what do you think? Can you keep your chickens healthy without the use of chemicals and antibiotics? Makes sense to me! If it works for humans, why not for chickens? When I build my coop, maybe I'll plant some of those herbs in the run and let the chickens forage. What do you think? Would that work? It would work right up until they ate them all and yanked out the roots! I would instead plant the herbs just outside your run so its convenient to just snip some as you pass on your way to the coop. So glad that we are hearing about more natural ways to raise hens. Natural is always best. Thanks for sharing! I just checked it - it looks fine to me. Once you click on it, click on the photo of the chicks and it should bring up the article. I am trying.....have herbs on the table growing and hopefully can transplant to a flower bed to get their size!! What great advice! I take oregano oil every day for it's healing and cleansing capabilities - glad it will be good for my future flock as well. Thanks for sharing this great info! Learned something new today! I will be using this advice for sure!! Thanks for sharing. My girls thank you too!! Thanks for the info on oregano. I will be adding it to my herb garden hoping the furry critters don't eat it ALL up. Love your Blog even if I do not have chickens...yet. I have an herb garden, and some pots with aggressive herbs like mint & oregano. This makes sense and I'll be sure to share the wealth with our ladies. Oregano oil is very popular for humans, so why not chickens? I'm all for natural. I've been following your advice from the beginning Lisa, and I have very healthy girls!! Thank you for all your work! Since reading that article I've been adding oregano oil to my chickens water. When I brought the day old chicks home I added it to their water (it can prevent cocci too). This way I know everyone is getting it. I do add the dried herb to their food as well (also garlic). I *had* one oregano plant coming up but guess who found it? So, yeah, that was decimated in seconds! I have to find a spot to plant it that they can't find! Oh no! Well, at least they'll be healthy! This is awesome information. I have been getting my family to drink kefir lately as well as elderberry to fight some nasty cold that is hanging around...I am hoping this is for humans to because I will make oregano everything to get rid of this uck that I have! I take elderberry as well and in fact just planted our first elderberry bushes! Oregano is for humans too. I'm glad to know this! Thanks for sharing on The HomeAcre Hop! Hope to see you again tomorrow! Have you figured out the dosage for Oregano Oil? For a human it's 1 drop, how do we dose for chickens? I've never read an exact dosage for chickens for the oil which is why I prefer to use fresh or dried herbs and let the chickens eat them free choice and control their own doses. I would say a drop or two into their water would suffice if you use the oil tho. Makes sense to me. My ladies are always munching and dust bathing in my herb garden. Besides the compost patch the herb garden is there favorite place in the yard. Thank you for passing along the information. Thanks for your great blog site. I am now feeding fresh oregano, mint, cilantro, parsley and lavendar to my girls. What about scented geranium? I put some in their laying boxes along with bay leaves and rosemary. I'm hoping it will keep the mites down. Unfortunately when I put oregano oil in their water they stopped drinking it. I put 1 drop / gallon. I know it's potent stuff. At least they really like the fresh oregano. Keep up the natural help methods; I probably wouldn't have thought of it on my own.